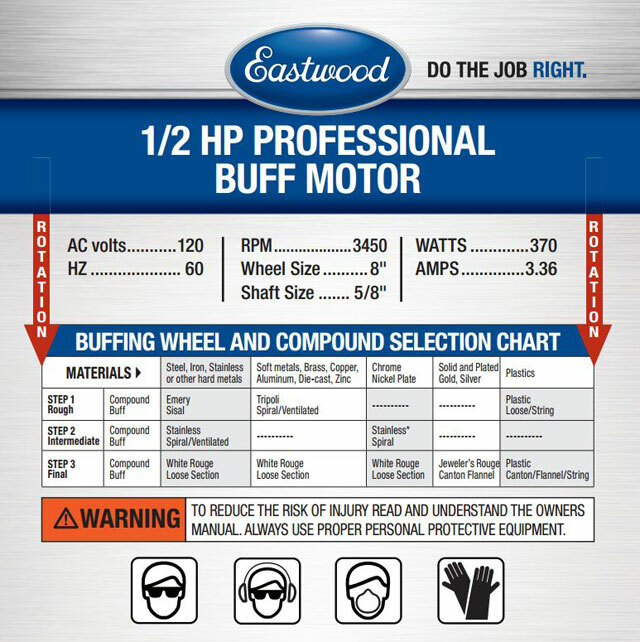 Eastwood 1/2 HP Buff Motor is rated 4.5 out of 5 by 12. 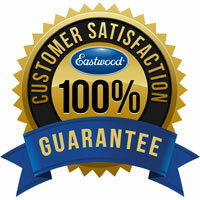 Rated 5 out of 5 by Don B from Eastwood 1/2 Buffer Has more than enough power to do the job ! 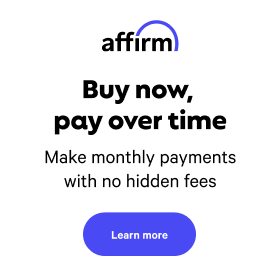 Would recommend Buffer to everyone ! Rated 5 out of 5 by mrjata from Outstanding product!! Got this buffer to replace a home made unit and the p.o.s. I got at HF. Quality unit with power to spare. Get the wheel and compound kit too, save yourself time and hassle. Unless you plan to really bare down on the polishing, have a production shop or need to polish plastic at a lower speed, this one will do it! Rated 5 out of 5 by mrjata from Well worth the money After fighting the HF piece of junk, I finally caught Eastwood putting this buffer on sale and I jumped. Wow, what a difference. This buffer is great, never bogs down and doesn't get hot. Now for patience and more compound. Can i put a variable speed controller on it and slow down the RPMs? We have never tested this unit using a speed controller on it. We apologize for any inconvenience in confusion. This unit is shipped with a 5/8 inch arbor which fits buff wheels with a 1/2-5/8 inch hole. How much does this 1/2hp polisher weigh ? If i have problems with it like quits working or starts getting hot will it will it coved by the 1 year warranty ? This unit weighs about 30 lbs. This item ha sa 1 year warranty against defects as stated. 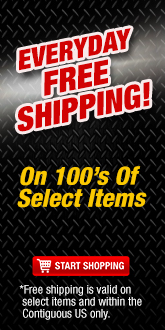 You will need to call into customer service to get the parts you need. This is a one speed buff motor. What size are the threads on the shaft? Can a elec. speed controller be used? i don't think so, must have 220v volt motor to use a vfd. Can this also use wire brush wheels? 1/2-HP Buffer runs at 3450 rpm for buffing metal or plastics. 5/8"-diameter shaft fits buffing wheels with 1/2" soft-center arbor holes. Overall actual width is 22-3/4". Shaft extends 6-3/4" beyond the bell-shaped sealed motor housing. 110v AC. CE-approved.